Aman Abdurrahman in court today. 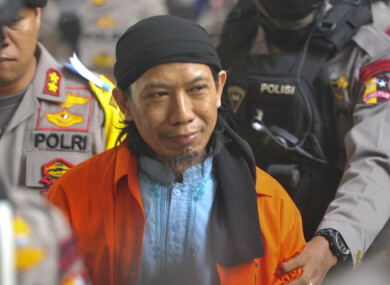 A RADICAL INDONESIAN cleric has been sentenced to death for masterminding a 2016 Islamic State terror attack that saw a suicide bomber blow himself up at a Starbucks café. Aman Abdurrahman was found guilty of ordering the attack that killed four people in Jakarta, as heavily armed police guarded his sentencing at a court in the capital. “(The defendant) has been proven to have committed a criminal act of terrorism,” judge Akhmad Jaini, who also cited Abdurrahman’s involvement in other deadly plots, said. Abdurrahman — who was already in jail on a separate terror conviction — gestured to his legal team and briefly kissed the floor, as machine gun-toting guards stood nearby. His lawyer, Asludin Hatjani, said the ruling was “unfair”, citing a lack of evidence connecting Abdurrahman to the attack, which he was accused of organising from inside prison. Executions are carried out by firing squad in the world’s biggest Muslim-majority country, which has long struggled with Islamist militancy. In 2002, bombings at the resort island of Bali killed over 200 — mostly foreign tourists — in Indonesia’s worst-ever terror attack. Three militants involved in the Bali bombing have since been executed. The assault in the capital two years ago saw security forces battle radicals near the café where a suicide bomber detonated his explosives. Considered the de facto head of IS supporters in Indonesia, Abdurrahman (46) is also the spiritual leader of local extremist network Jamaah Ansharut Daulah (JAD). JAD was involved in the 2016 Jakarta attack and a wave of suicide bombings last month in Indonesia’s second-biggest city Surabaya, according to authorities. Two families — including girls aged nine and 12 — blew themselves up at churches and a police station, killing 13 people. Abdurrahman has not been charged in relation to the Surabaya attacks. “It’s seen as heroic — he’ll become a martyr,” Al Chaidar, a terrorism expert at Indonesia’s Malikul Saleh University, said. From prison Abdurrahman has recruited militants to join IS and is thought to have been in communication with leaders of the jihadist group. He is the main translator for IS propaganda in Indonesia, according to analysts and authorities. Although considered Indonesia’s largest pro-IS coalition, JAD’s structure and links to the network are murky. The Jakarta-based Institute for Policy Analysis of Conflict has said JAD is “a generic term” for any IS supporter and functions more as an umbrella organisation than a coherent group. Email “Indonesian cleric sentenced to death over terror attack”. Feedback on “Indonesian cleric sentenced to death over terror attack”.